Not only am I still cleaning I predict I will be for quite some time yet. However I am making progress. Today I wanted a solution for the short cut half yards and all fat quarters. These are too small to be wound onto the comic boards. I have had a cunning plan to repaint a chest of drawers that live near my longarm. They are plywood painted off white atm. 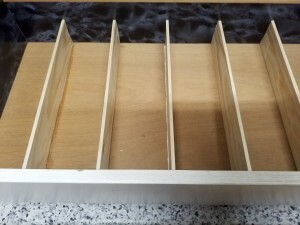 In time I will paint the carcass gloss black and the drawers shades of grey. 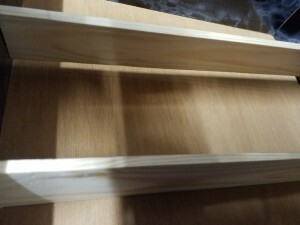 First however I am modifying the inside of the drawers. They are currently unfinished ply wood, not ideal to put fabric on. They are also a wide open space which encourages me to just chuck stuff in. Also not good for fabric. 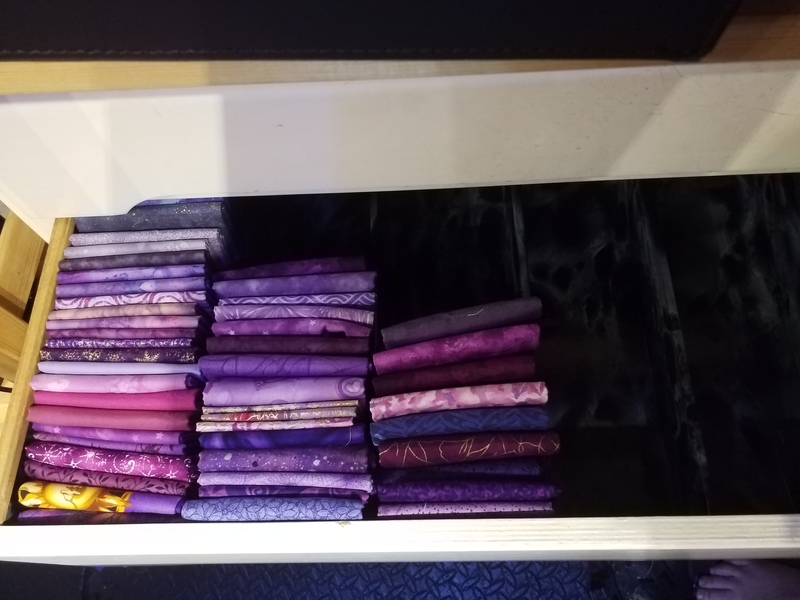 Having done some measuring I have worked out a way to fold fat quarters so they fill the drawer height and I can fit 6 columns across the drawers. 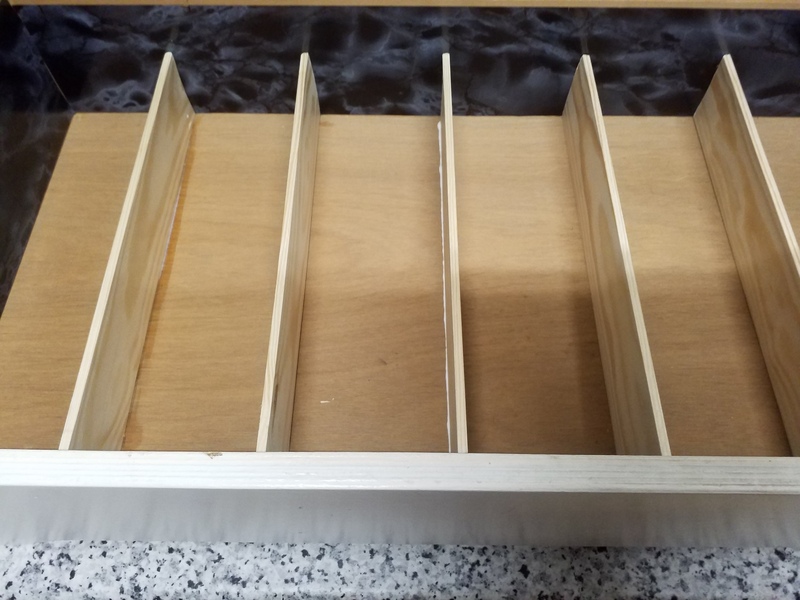 This meant I needed to add 5 dividers. After a quick raid of Homebase I have a couple of long thin planks and some Fablon. I think I need 2 more planks if I am goingto convert all 4 drawers but the 2 rolls of Fablon will be enough. 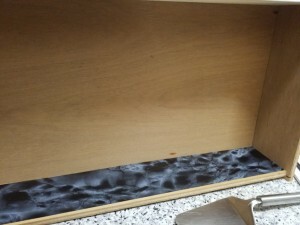 Before you ask her I did consider a colour other than black for the drawer lining. I couldn’t live with plain white it will always look grubby. Both the pale wood effects had grain patterns that looked weird to me and I really didn’t want a bright colour or pattern as it may distort the way I see the fabrics. 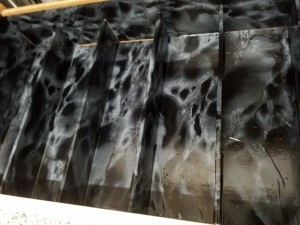 So black marble was the winner. Not that I can see much of it with the fabric in the drawer. I am very pleased with the way this is working out. 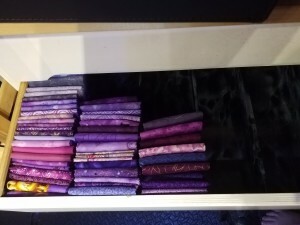 It was fiddly working out how I needed to fold my fabrics for my drawers, and that will be different for each drawer size, but you only need to work it out once. After that every piece is folded the same way. This system seems to be very space efficient. Certainly a lot is vanishing into this drawer, and it is all visible once in there. I also got some paper clips while I was out to try on the fabric on the boards. I like them much better than the Bobby clips. So tomorrow I may need to go and get more paper clips as I only bought 100. Yes I am seriously hoping to have 200 pieces of fabric wound and stored by then. So far the biggest piece on a comic backing board is 184 inches. It works but it is getting quite bulky by that size.